Do you ever wish that you could just wave a magic wand and all of your teen’s math frustrations would disappear? Do you wish that you had a friend who could step in and guide your teen through the ups and downs of learning math with the same care and compassion that you bring to your homeschool? Mr. D is that friend! Within moments of logging in to our first live Mr. D Math class, I knew that Mr. D was everything my teens need in a math teacher. I was given access to the Pre-Algebra class without charge and compensated for my time to write this article. However, I was not required to write a favorable review. The views that I share here are my own. Mr. D says, “Math is a language, a systematic means of communicating by the use of sounds or conventional symbols.” The idea is simple, yet powerful. Math is a language and Mr. D speaks the language of math in a way that makes senses to teens! As my daughter and I dove into that first live class, I was immediately grateful for the chance to review the service. I am always on the lookout for new ways to engage my kids, especially in math. It seems that their needs change almost as quickly as their socks, so I love to know our options in order to be prepared for when our math approach needs a change. This has been especially true as my little ones have turned into teens. They are more keenly aware of what works for them and what their own goals are for the future. For that reason, I was thrilled to discover that Mr. D Math has been approved by the NCAA! We have a budding baseball player over here whose dream it is to play ball beyond graduation. I’m glad to know that we have options that will help him continue to homeschool and meet the requirements of the colleges that he may one day consider. Mr. D Math is NCAA approved! Mr. D is an Online Math Teaching Wizard! Mr. D. knows his stuff and knows how to relate it to kids! It’s one thing to be skilled in math. It’s an entirely different gift to be able to explain math in a way that is inviting and encouraging to kids! Mr. D does this! The online classroom is warm and inviting as Mr. D encourages questions and effort! Mr. D Math is Flexible! Mr. D allows us to select the format that works for us. 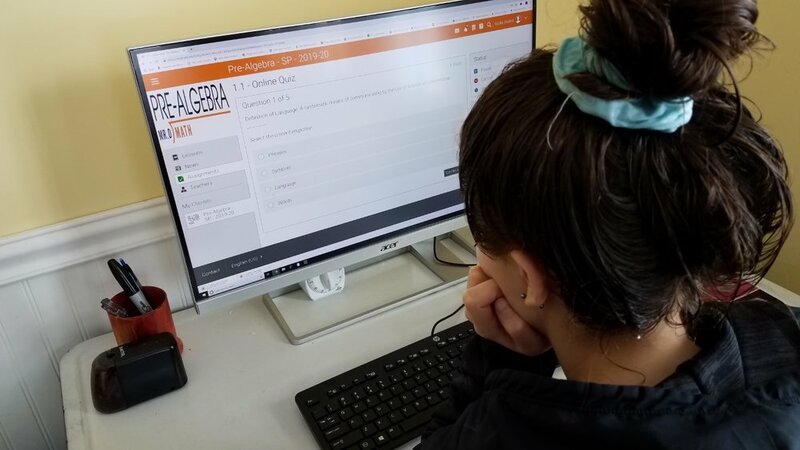 We can select from the self-paced program with generous email support from Mr. D and his staff, online curriculum and online class, or online curriculum and in-person class. We also have the ability to take Mr. D with us wherever we go! This means we can still carve out time for a little math exploration when we’re out for the day; at the library, waiting for swim practice to wrap up, or settled onto a blanket at the park. We were even able to download the videos and classwork to take with us! No more excuses for sweeping math to the side. We can enjoy a day out and still meet our assignment goals! Revisiting a topic and getting extra help is easy with Mr. D Math! A weekly extra-help session is available, and we are able to re-watch the lesson videos as many times as we need to! I love that my daughter can master the concepts of Pre-Algebra before moving on to Algebra! Mr. D. is engaging, encouraging, and energetic! All these traits that fly out the window when I’m tired or overwhelmed. Mr. D brings a calm, yet invigorating presence to the math lesson. Whether we were learning from a pre-recorded video or participating in a live class, we found our math anxiety melting away. At the same time, Mr. D’s enthusiasm for math is contagious! We found ourselves smiling along as we listened to the lesson. Math and smiling had previously been an nonexistent combination! Mr. D Answers Questions Quickly! Unlike many curriculum options, Mr. D is available to answer questions! With a quick email, my questions were sent and the response was typically received within minutes! Whether this was a question about a Pre-Algebra problem or a more general question about using the classroom, Mr. D’s replies were always speedy! As a busy mom, who juggles many tasks, I was grateful for the prompt answers to my questions. This meant that we stayed focused on math rather than letting our attention slide on to something else! Mr. D Makes Math Easy! It was a privilege to dive into Mr. D’s Pre-Algebra class with my daughter. Not only were the math lessons engaging and easy to follow for my daughter, the program was user-friendly for me! Mr. D takes the guesswork out of what skills my daughter needs to prepare for Algebra, and allows me to enjoy the journey with her! Mr. D is a friend to homeschoolers!